He is the man behind Grey Matter Dollar Baby Film. Austin T. Hill: Well, I’m a Colorado Native and a lifelong lover of storytelling in all its forms – from screen, music, novels, and radio plays to comic books! I studied Theatre and Film at Metro State University, graduating in 2014. Over the years on our Youtube Channel, SaulsburyStStudios, my filmmaking team and I reached a great fanbase with a web-series entitled “The Great Nerf War” for which we’re wrapping up our fifth and final season! I’m also a lifelong animal lover/advocate and currently work at The Wild Animal Sanctuary! It’s a large acre non-profit sanctuary home to hundreds of rescued large carnivores. I sincerely believe in a passion-driven life, surrounding and filling your days with everything you love. Austin T. Hill: The exact moment is tough to pinpoint. I’ve always been the kind of person for whom it’s not enough to simply take part in something I truly love, I want to be a part of it. Since I was a teenager, I’ve been making movies with friends on my Dad’s camcorder, basically editing the movies as we went (many of which were in the horror genre)! I’d say Jurassic Park and The Lord of the Rings Trilogy have had the largest, most profound effect on me and my imagination as a filmmaker. SKSM: When did you make Grey Matter? Can you tell me a little about the production? How much did it cost? How long did it take to film it? 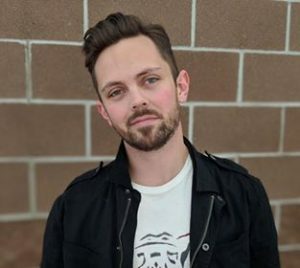 Austin T. Hill: Grey Matter’s script was mostly written toward the end of 2017 and filmed in the late Spring/Summer of 2018. As a general rule, when/wherever I film, I prefer to do so with close friends and family. Because of my acting background, I’m incredibly fortunate to be surrounded by wonderfully talented people who all agreed, pretty much immediately, to embark on this adventure. To me, this is a dream cast. The same can be applied to our locations; they were available to us through the generosity and graciousness of those friends and family. Because of this, I was really only paying for logistics like props, equipment, and food, so our budget resided around $1,000. SKSM: How come you picked Grey Matter to develop into a movie? What is it in the story that you like so much? Austin T. Hill: My best friend and writing partner, Sam Nicoletti, first informed me of the Dollar Baby program a few years ago. We filed the idea away, saving it for a later time when we’d be better able to approach such an endeavor. Last year (2017), the idea came up again and we didn’t hesitant to apply! Austin T. Hill: When it comes to working with adaptations of great work, I’ve read King himself say “Why f**k with genius?” The story is already incredible; it doesn’t need changes from me in the way of its content. However we did make a few of our own purely because of logistics with filming. One change made was substituting a heavy Autumn thunderstorm in place of the Winter blizzard – due to the time left to film and snow predictability. I wanted the storm to land in the final act as Henry, Carl and Bertie, or the “Trio of Terror” as I call them, confront what Richie has become in his apartment. On the night we filmed this scene, no rain, let alone a thunderstorm was in the forecast. I kid-you-not, as we’re filming that very moment, thunder boomed outside so loud we all paused, shocked to hear it! Soon, rain poured and lightning illuminated the street! Definitely a moment where we felt as if we were all exactly where we were supposed to be. Austin T. Hill: I wanted to do this for that young Austin hearing the story for the first time. The opportunity to film it (non-commercially of course) with permission, was too amazing to pass up. Everyone involved worked so hard going the extra mile to tell this tale – to be part of something special. Of course, I would love to share what we made on a more public scale, but we know we made it and love how we got there. Austin T. Hill: Pretty positive reactions so far, I’m happy (and relieved) to say! I’ll always find things to tweak and change but once I submitted our copy of the film, that was my threshold to stop editing. I know our cast delivered really terrific performances and our reviews reflect that! I did all the music as well, which especially terrified me because bad/good music can truly change the final product. A huge part of post-production was just writing, performing and applying score. If a piece didn’t fit the scene, then repeat the process. I actually tested some pieces by placing score in the trailer. Fortunately, the music has also been well received! Above all else, I just wanted to do our cast and this story justice. Austin T. Hill: Not necessarily, but that’s not to say it’s never happening, just not in the plans at the moment. Austin T. Hill: Huge. My favorite author through and through! My favorite book of all time is IT, which I read annually. I adore the 1990 miniseries, and thought the 2017 re-adaptation was sensational. It’s a grand time to be a King fan! Austin T. Hill: Sadly, I did not – but he’s a busy guy! I’m not sure if he’s seen it, but I do know the package landed in Maine, thankfully. If anything, I think he’d find it among the most faithful of the “Grey Matter” adaptations. Along with our movie’s copy, I included a handwritten letter expressing my hope that the love for the story comes through onscreen. Austin T. Hill: Filmwise, I’m currently in post-production for two Western shorts we filmed over the last couple years for our Youtube channel. Those, and that finale of our series, “The Great Nerf War”! And, of course, I’m always writing! SKSM: What’s one thing people would be surprised to know about you? Austin T. Hill: Since grade school, I have absolutely loved the Universal Classic Monsters with Creature from the Black Lagoon being my favorite. I’ve always wanted to direct the remake of “Creature” – with all practical effects of course. However, as a kid I’d be extremely opposed to “modern” scary movies as I was too scared! I refused to watch one. Absolutely refused. It wasn’t until a very reluctant family movie night screening of M. Night Shyamalan’s Signs that changed my outlook completely. Austin T. Hill: Thank you for this wonderful opportunity! I’d encourage those reading this to celebrate what you love. Write your songs, reach out to your heroes, audition for that part, write that book, donate/volunteer for that cause. We only have one life to live, so let’s leave the world a better place than when we arrived! Austin T. Hill: Stephen King rules!